Ah golf — the sport of kings! There's nothing like a good day out on the golf course. That is, until all the wildlife and native peoples you've displaced start reminding you that there's blood on your hands. That's where Envirogolf comes into play! Envirogolf takes golf simulators to the next level. 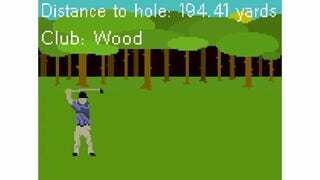 Instead of just simulating the experience of playing golf, it also hilariously reminds you of the untold environmental and social costs involved. With every stroke, a native resident of the land chimes in to remind you of the resources required to create a massive, under-utilized playground for middle-aged men to hit balls around in. You can play it here. Honestly, it's a hell of closer to life than Tiger Woods PGA Tour. Seriously, visit certain parts of Florida some time and you'll get what I mean.